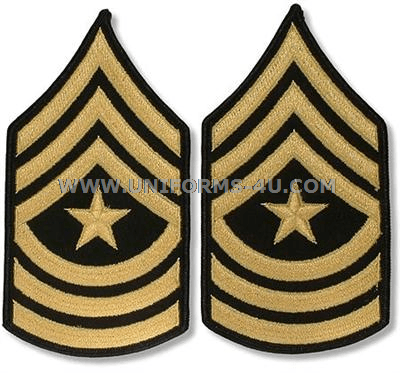 Designated in Army regulations as nonsubdued sew-on grade insignia, the instantly recognizable golden chevrons, arcs, and star that signify the rank of Sergeant Major (E-9) are worn only on the jacket sleeves of dress uniforms, viz., the Army Service / Dress, Blue Mess, and White Mess Uniforms. Please review your selection of the color of the fabric upon which your Sergeant Major chevrons will be embroidered before proceeding to checkout or continuing shopping. Chevrons sewn onto white fabric may be worn only on the White Mess jacket, while blue backing fabric is employed for chevrons that will be placed on the Blue Mess or Army Service / Dress uniform jacket. 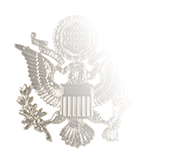 Per Army regulations, we offer Sergeant Major nonsubdued sew-on grade insignia in two sizes, Large and Small. 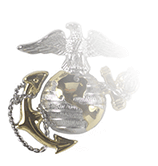 (These designations replaced “Male” and “Female” insignia sizes in 1996). 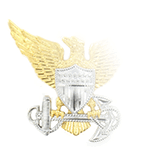 The rank of Sergeant Major was introduced in the U.S. Army on July 16, 1776 with a Congressional resolution specifying that the commanding officer of each regiment appoint a “serjeant major” (along with a quartermaster sergeant, drum major, and a fife major). 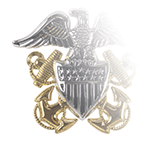 A variety of insignia were used to denote this rank in the decades that followed, including colored epaulettes, sashes, plumes, and even a chevron. 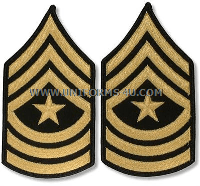 But it was not until the Army issued new uniform regulations in 1847 that the Sergeant Major insignia was given the now-familiar design of three chevrons (points up) above three arcs. (Actually, the regulations describe it as “three chevrons and an arc,” i.e., singular). This edition of the of regulations also saw the first appearance of a lozenge in Army heraldry (used then and now for the rank of First Sergeant). 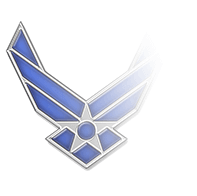 The rank of Sergeant Major was disestablished in 1920, subsumed by the rank of Master Sergeant, but was revived in 1958 with the creation of two new enlisted pay grades (E-8 and E-9). At that time the five-pointed star was added to the trio of chevrons and arcs, and the design has remained the same ever since.